The Vertigo blog, Graphic Content, has posted a few preview pages from next week’s iZombie #6, the “Spot-light” issue entitled “I, Were-Terrier.” To save your clicking finger, I’ll just post them all here, shall? (This is my favorite issue of the series to date, I should point out.) The issue will be on stands October 6th, so be sure to mark your calendars! I’ve been following Caanan Grall’s “Max Overacts” strip on his Occasional Comics Disorder blog for a while now and really enjoying it, but it took a post on Comics Should Be Good to compell me to talk about his work here. The post was part of their ongoing art challenge thingee, where the Comics Should Be Good writers toss out a theme, readers send in ideas, and then artists illustrate them. This week’s theme was mash-ups or team-ups between comic book and literary characters. One reader suggested Edgar Allan Poe and Raven from the Teen Titans, and Caanan Grall brought it to life. There’s tons more great stuff on his website, so check it out unless you hate goodness or something. Thundarr The Barbarian on DVD! The complete series of Thundarr the Barbarian, arguably one of the high watermarks in human achievement, is now available on DVD direct from the WBshop.com. The series featured the work of Jack Kirby, Alex Toth, and Steve Gerber. Also, a laser sword and giant cat guy. The DVD apparently won’t be in stores, and is only available online. I’ve already ordered mine, what are you waiting for? Evan “Doc” Shaner has been posting loads of nifty Popeye drawings to his Tumblr and DeviantArt accounts this last few days, as warm up for the latest Comic Twart theme, but he’s saved the best for last. Check it out. – Castor: In discovering the strip I was really taken with Olive’s brother, Castor. He basically brings Popeye into the strip after all and he’s got a great face for cartoons. I’m a little disappointed now that he and the rest of the Oyl family were never in any of the cartoons. My favorite part in this piece is watching his face as the strip goes along. – That’s Brutus in the 2nd, 3rd, and final panels, not Bluto. Frankly, Brutus is a heck of a lot funnier to me. It’s probably the crossed eyes and uni-brow. – The 5th panel has got Poopdeck Pappy, who I’ve never drawn before, but I have drawn Popeye and plenty of beards. – The 6th panel is a reference to the inital story where Jack Snork shot Popeye while at sea and Bernice the Whiffle Hen basically saved his life. – Eugene the Jeep is hanging out on the gutters between the panels, as creatures who can pass into the fourth dimension tend to do. This is a reference to what I think is one of the funniest gags ever. – The 7th panel is from Aladdin and his Wonderful Lamp. – The 8th panel is from the short Goonland. – The 9th panel is from Popeye the Sailor meets Sindbad the Sailor. The giant buzzard from that cartoon is my stand-in for Bernard, the Sea Hag’s buzzard, both of which I wanted to put in here but didn’t get to. There’s Bluto in the back as Sindbad. 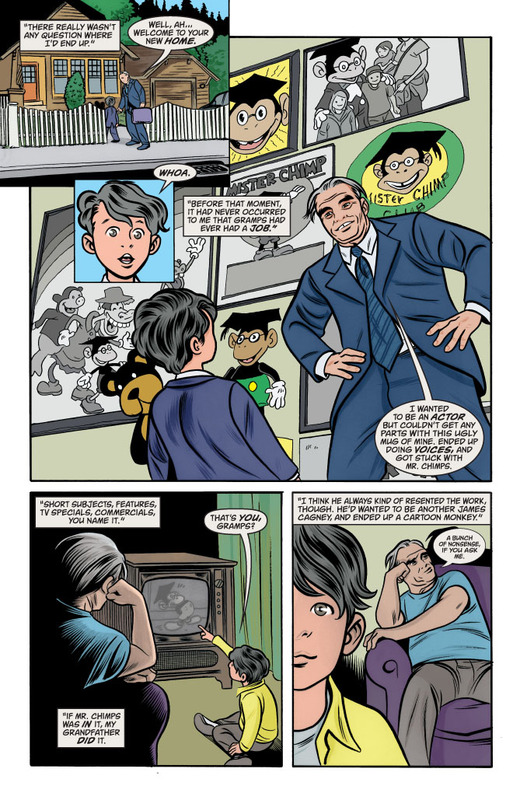 – The 10th panel is a reference to the last scene in the 1980 live-action movie featuring Robin Williams. Olive and Wimpy are in there if you look real close. – And the rest of it is just me foolishly trying to be Segar. (via) I would totally watch this movie.